Fishers Mobile Farm - we bring our farm to you! for children of all ages to experience farm life without leaving your school, nursery or playgroup grounds. By introducing children to a range of farm animals in a safe, well organised environment we will provide an experience that motivates to produce quality work with links across the National Curriculum. creative package of worksheets and ICT resources included. In accordance with DEFRA regulations, no other livestock can be present in the area. We have gazebos to keep your children & our animals dry if rain or cool if sunny (!!). All our animals are securely enclosed in pens allowing children to get close to the animals in a safe & fun environment. 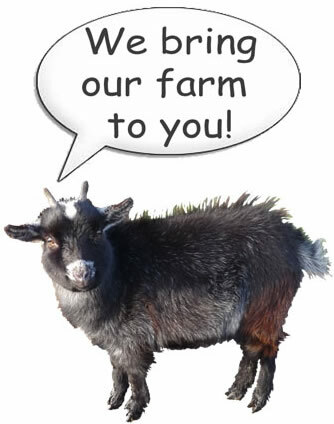 We bring our farm animals to schools, nurseries, fayres, family days & promotions across the whole of the North West including Greater Manchester, Liverpool & Merseyside & the whole of Lancashire. For education or for pleasure, our mobile petting farm is a great attraction for young & old, town or country - we can bring our country farm into your urban area. Our animals would love to meet you!